The Wallace Restaurant is located inside the Wallace Collection art gallery. This modern European brasserie is flooded with natural light in a glass-covered courtyard making it feel like an al fresco dining spot. The Wallace Restaurant is operated by Peyton and Byrne and it's a real gem. What's not to love about dining on fine food near exquisite fine arts, porcelain and furnishings? The Wallace Restaurant is reached through the main entrance for The Wallace Collection. Do not be surprised when officious gallery staff order you to take your bag to the cloakroom - it happens every time I'm there even with the smallest of bags. Just tell them you are going to the restaurant and you can then keep your belongings with you. Some of the courtyard space is a cafe, so you can stop by for a drink without a reservation, and the rest of the space is taken over by the restaurant. 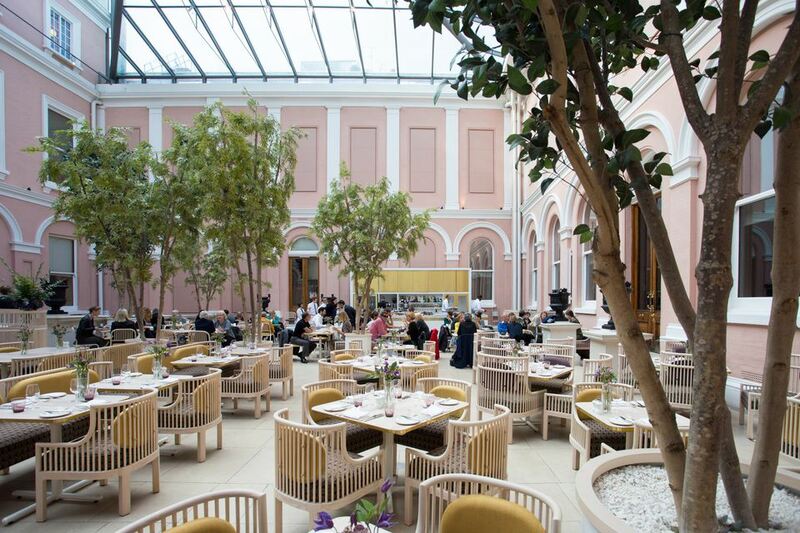 As part of The Wallace Collection's Centenary Project in 2000 the museum acquired a range of new facilities including this elegant restaurant in the covered courtyard. This double height atrium in the heart of the building reminds me of the Winter Garden at The Landmark Hotel. The walls are salmon pink and there are plenty of tables for two and larger tables available as well. The tables feature a floral arrangement and a glasses of water are served when you take a seat. The Wallace is managed by Peyton and Byrne who also run The National Dining Rooms at The National Gallery in Trafalgar Square and Inn The Park in St. James's Park, plus many others. We chose the English Afternoon Tea which is served on a full three-tier cake stand but you could also choose a cream tea (scone with clotted cream and preserves), or a Cornish Cream Tea which is made up of a scone and finger sandwiches. If you want to celebrate a special occasion you could add a glass of Champagne too. I was very impressed by the large selection of teas on offer and the staff was able to offer advice to help us make a decision. I chose the Elderflower and Ginger brew which was naturally sweet and delicious. My companion chose the Earl Grey Bluestar which was very good too. Tea is served in a black Chinese teapot with a stand. (Quick tip: keep the teapot handle up or it gets too hot to hold if resting against the pot.) The table crockery is all plain white. Extra hot water was offered without asking which is always a sign that staff understand the quality of the tea they are serving. The silver three-tier cake stand cleverly features side plates instead of dinner plates which meant we could easily fit two cake stands on a small table. I'd not seen these slimline cake stands before and thought they were an excellent idea. We received four finger sandwiches each on brown and white bread. The standard sandwiches include ham, smoked salmon, chicken and cucumber, but I was able to ask for vegetarian options with no problem. To add interest to the savory course, the cucumber sandwich had wasabi butter which tasted a bit like mustard but with a bigger kick. On the middle layer of the cake stand each diner receives a very large homemade scone with small pots of clotted cream and strawberry preserve. The scone was still warm after we had finished the sandwiches and it cut without crumbs. The top layer of the cake stand is for the sweet treats and we had three each. I had a lemon meringue pie, white chocolate cheesecake and a chocolate and raspberry heart, but, of course these may vary. I had heard many good things about the afternoon tea at The Wallace and I have to say I concur. We stayed for about an hour but had drunk and eaten plenty and certainly didn't feel rushed. Service was great and the staff was very welcoming and efficient. The whole experience felt wonderfully indulgent at an incredibly good price (£18.50). This is somewhere I would definitely recommended and hope to return many times. Use Journey Planner or Citymapper to plan your route by public transport. Days and Times: Seven days a week. Photography: Permitted. Staff will help. For more afternoon tea reviews see: Best Afternoon Tea in London.